The 2012 Olivier Awards with MasterCard ceremony has come to a close with the Royal Shakespeare Company’s hit show Matilda The Musical the biggest winner of the night, taking home a huge seven awards. While the show’s creative team swept the board collecting the Best Set Design (Rob Howell), Best Theatre Choreographer (Peter Darling), Best Sound Design (Simon Baker) and Best Director (Matthew Warchus) Olivier Awards, the musical was also named Best New Musical. 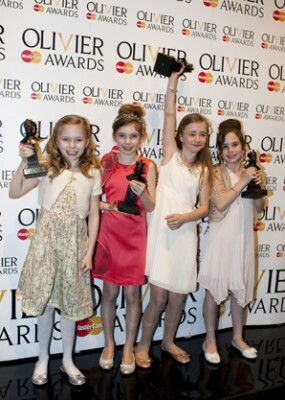 The acclaimed cast were not left empty handed with an Olivier Award record-breaking win for the four Matildas who share 2012’s Best Actress in a Musical Olivier Award, becoming the youngest ever recipients of an Olivier Award. Bertie Carvel, who plays their fearsome headmistress, was named Best Actor. Held at the Royal Opera House and presented by Sweeney Todd co-stars Michael Ball and Imelda Staunton, tonight’s star-studded ceremony and celebration of the best of London theatre has given many of London’s most-lauded venues and famed stars a reason to celebrate. The Regent’s Park Open Air theatre triumphed with Crazy For You collecting not only Best Costume Design (Peter McKintosh) but also Best Musical Revival, marking the third time in as many years the alfresco venue has been awarded the accolade. The much-decorated National Theatre’s award success continued this year following seven wins in 2011. While it didn’t match this number at tonight’s ceremony, the Southbank venue succeeded in three categories including the Best Actor Olivier Award, which was shared by Benedict Cumberbatch and Jonny Lee Miller for their high profile roles in Frankenstein, and the MasterCard Best New Play which saw fellow NT nominee One Man, Two Guvnors pipped to the post by John Hodge’s black comedy Collaborators. It was also a good night for London’s intimate Donmar Warehouse with Anna Christie taking home two awards; Best Revival and Best Actress, which saw Ruth Wilson accept her second Olivier Award after her 2010 win for another Donmar hit, A Streetcar Named Desire. The 2012 Olivier Awards saw Sheridan Smith too triumph for a second time. After her 2011 Best Actress in a Musical win, this year the prestigious awards recognised her work in drama Flare Path, with Smith winning Best Performance in a Supporting Role. In the opera and dance categories it was a hugely successful night for the English National Opera who won both Best New Opera for Castor And Pollux and the Outstanding Achievement in Opera Olivier Award, recognised for its entire exceptional season. The Royal Opera House was recognised with Royal Ballet principal dancer Edward Watson winning the Outstanding Achievement in Dance Olivier Award, while Sadler’s Wells took home Best New Dance Production for the acclaimed DESH. In other categories, Derren Brown was awarded his second Olivier Award, winning in the Best Entertainment and Family category for Svengali, and Theatre Royal Stratford East took home the Outstanding Achievement in an Affiliate Theatre accolade for Roadkill. Guests at the star-studded event, along with BBC Red Button and online viewers from across the world, enjoyed exclusive performances tonight from shows including Matilda The Musical and Ghost The Musical, as well as tributes to Special Olivier Award winners Sir Tim Rice and Dame Monica Mason, who were both recognised tonight for their outstanding contribution to theatre and dance. 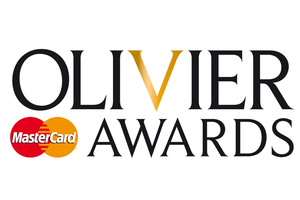 Join the conversation on Twitter using #oliviers2012 as all the winners and nominees from tonight’s ceremony celebrate a fantastic year for the theatre capital of the world. 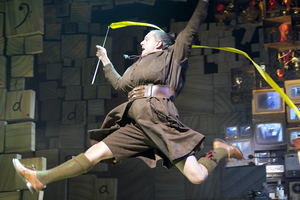 The Royal Shakespeare Company’s Matilda The Musical leads this year’s Olivier Awards with MasterCard nominations, recognised in 10 categories, the maximum number of eligible awards for a musical at this year’s awards. Announced at the May Fair Hotel today by 2011’s Best Actress and Best Actor Nancy Carroll and Roger Allam, all four young actresses playing the magical lead role are nominated collectively for Best Actress in a Musical, while Bertie Carvel is recognised for Best Actor in a Musical and Paul Kaye is nominated for Best Performance in a Supporting Role in a Musical. 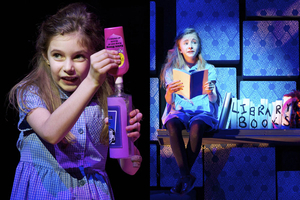 The hit Roald Dahl musical faces competition in the coveted Best New Musical category from Betty Blue Eyes, Ghost The Musical, London Road and Shrek The Musical, all of which boast nominations in other categories, with Ghost The Musical racking up five nominations. 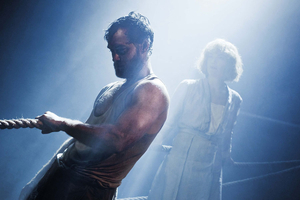 The National Theatre lead the way for plays with an impressive 15 nominations, which includes recognition for hit comedy One Man, Two Guvnors, musical London Road, Danny Boyle’s Frankenstein and new plays Grief and Collaborators. One Man, Two Guvnors, which has already collected a host of awards this season, leads the pack with five nominations including the much coveted MasterCard Best New Play, facing competition from fellow NT show Collaborators, the Royal Court’s Jumpy and madcap comedy The Ladykillers. 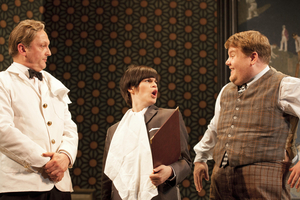 The show’s star James Cordon is recognised for his critically acclaimed performance in the Best Actor category. Cordon faces competition from two other NT stars Benedict Cumberbatch and Jonny Lee Miller who share the nomination for their high profile performances in Frankenstein. They are joined by David Haig for his TMA Award-winning role in The Madness Of George III, Olivier Award-winner Douglas Hodge for Inadmissible Evidence and Jude Law for the Donmar Warehouse’s Anna Christie. Law’s Anna Christie co-star Ruth Wilson also celebrates success today nominated for her role in the Best Actress category with Marcia Warren (The Ladykillers), Lesley Manville (Grief), Kristin Scott Thomas (Betrayal) and Celia Imrie (Noises Off) joining her in the category. Directors Sean Foley (The Ladykillers), Nicholas Hytner (One Man, Two Guvnors), Rufus Norris (London Road) and Matthew Warchus (Matilda The Musical) are recognised in the Best Director category. Continuing 2011’s drama success is Trevor Nunn’s centenary celebration production of Terence Rattigan’s Flare Path which, as well as being nominated in the Best Revival alongside Noises Off, Much Ado About Nothing and Anna Christie, sees last year’s Best Actress in a Musical winner Sheridan Smith nominated for Best Performance in a Supporting Role. Affiliate theatres are also celebrated at this year’s awards with the Lyric Hammersmith’s production of Mogadishu, Theatre Royal Stratford East’s Roadkill, the Donmar Warehouse’s Salt, Root And Roe at the Trafalgar Studios 2 and the Royal Court theatre’s The Village Bike nominated for the Outstanding Achievement in an Affiliate Theatre Award. This year’s Best Actress in a Musical category sees Kate Fleetwood (London Road), Sarah Lancashire (Betty Blue Eyes) and Scarlett Strallen (Singin’ In The Rain) pitched against the four Matildas, while Carvel faces competition from Nigel Lindsay (Shrek The Musical), Reece Shearsmith (Betty Blue Eyes) and Paulo Szot (South Pacific). Musical revivals Crazy For You, Singin’ In The Rain, South Pacific and The Wizard Of Oz are also celebrated at this year’s award with the chance of taking home the Best Musical Revival Award. In the opera categories, English National Opera received six nominations, including an Outstanding Achievement in Opera nomination for the breadth and diversity of its artistic programming, while the Royal Opera House boasts three nominations. Sadler’s Wells is recognised for opera in one category and dominates this year’s dance awards with five nominations, with the Royal Opera House’s three nominations its only competition. Other nominated shows this year include Jerusalem and The Children’s Hour (both Best Performance in a Supporting Role), Lend Me A Tenor The Musical (Best Performance in a Supporting Role in a Musical), and Derren Brown: Svengali, Midnight Tango, Potted Potter and The Tiger Who Came To Tea, who are all nominated in the Best Entertainment and Family category. Mark Rubinstein, President of the Society of London Theatre, described the list of nominees as: truly representative of our diverse world-class London theatre across both the commercial and subsidised sectors, which continue to delight thousands of Londoners and visitors every day. Paul Trueman, Head of Marketing UK and Ireland for MasterCard Worldwide, said the company were proud to enter into the second year of our partnership with the Society of London Theatre and the Olivier Awards. We are delighted to extend our congratulations to the nominees of the MasterCard Best New Play Award. The most prestigious award’s ceremony in London’s Theatreland will take place at the Royal Opera House on 15 April. Theatregoers can follow full coverage of the event on www.olivierawards.com, by watching live on the BBC Red Button, listening to BBC Radio 2, or attending the Covent Garden Piazza event where the public can enjoy performances from some of London favourite shows and watch all the action unfold live on a big screen relay. Mark-Anthony Turnage for his composition of Anna Nicole at the Royal Opera House and Twice Through The Heart at Sadler’s Wells.